The Minimalist Thermostatic Bar Valve and Pro II Telescopic Shower Kit from Hudson Reed is part of our contemporary collection of bathroom products. A rigid riser kit provides your bathroom shower with a solid base, a fixed pole and shower head in one. It has a built-in diverter you can switch between the fixed head or hand held shower. 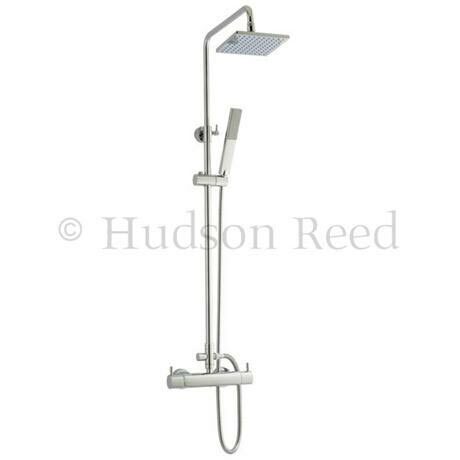 Give your bathroom a makeover with this Hudson Reed Thermostatic Bar Valve and Pro II Shower Kit. Q. is this suitable for a low pressure system? gravity fed? Hi, this thermostatic valve needs a Minimum operating pressure of 1 bar for best performance. Thanks!